Restorative dentistry is the practice of restoring form and function to damaged and missing teeth. At Forsyth Dental Partners, we offer several restorative dentistry solutions to help patients regain comfort and confidence in their smile. Crowns are restorations that resemble your natural tooth structure. Crowns can be used to either cap a damaged tooth, or are attached to a dental implant to a replace an irreparable tooth. The porcelain material we use to create our dental crowns simulates the strength and semi translucent qualities of your natural teeth. Dental bridges are fixed restorations that replace a missing tooth or teeth by linking artificial crowns to healthy teeth or implants. Full or partial dentures are used when several or all of your teeth need to be replaced. Our dentures are implant-supported for maximum stability and comfort. We provide full mouth restoration dentures that look and feel natural. Many people who experience anxiety over dental treatments have had negative experiences in the past and are fearful of being in pain. 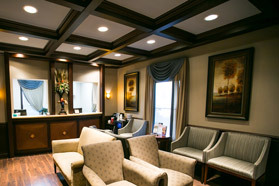 The following sedation options at Forsyth Dental Partners eliminate the pain and anxiety associated with dental care. Also known as laughing gas, nitrous oxide is administered through a breathing mask and promotes a state of deep relaxation. Anti-anxiety medication is prescribed and taken orally prior to your dental appointment to alleviate stress. At Forsyth Dental Partners we use The Wand® STA for administration of local anesthesia. 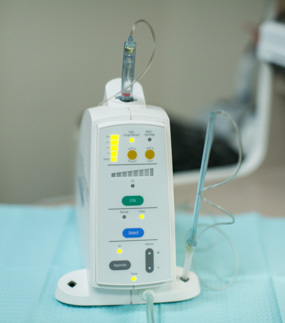 This system’s computer-regulated flow of anesthetic ensures your injections are consistent, accurate and painless. Dr. Carpenter takes comfort to the next level by warming his syringe and using a buffer to alleviate the sting of injections.